The latest Twitter client to fall victim to Twitter's token limits is the classic version of Talon, which is rather fitting seeing as the new Android 5.0 version of Talon was just released this weekend. In response, the developer has pulled the app from the Play Store so no one else will buy the app and be unable to use it. Maybe now the reasoning for the separate Talon Plus version is starting to make more sense. Twitter imposes a limit of 100,000 authorization tokens per app, which has resulted in the untimely death of apps like Falcon Pro in the past. 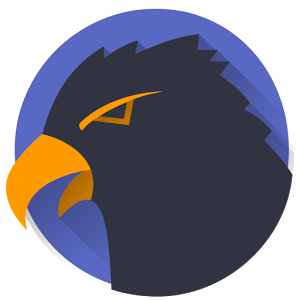 According to Talon dev Luke Klinker, he has been planning for this event, and that's one of the reasons Talon Plus was developed as a separate app and not just an update to the original one. It now has its own set of 100,000 tokens to run through until it too dies at the cruel hands of Twitter's API. So what does this mean for users of the classic Talon? Well, you can still access the app listing if you've bought it, but no new users will be able to find it in the Play Store. 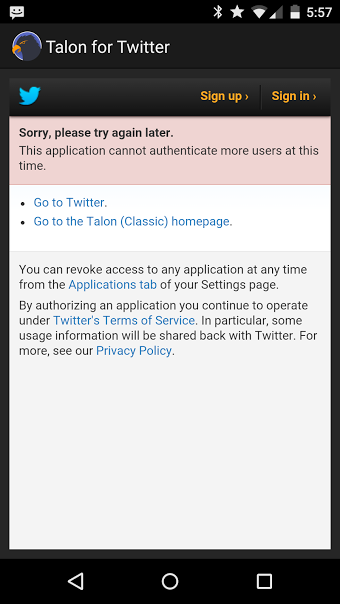 As long as the token remains in your Twitter account (check the authorized apps section of settings), you can keep using Talon on all your devices. Klinker also says he will continue improving Talon Classic in tandem with the Lollipop version. The source code of Talon Classic is going to be posted on Github in the near future, which is something the developer promised to do when the token limit was reached. So yes, you have to pay $4 for the Lollipop version of Talon, but this way Klinker has reason to continue working on Talon. We should remember most developers are doing this as a job, and they shouldn't be expected to work for free. Other developers have simply abandoned their Twitter clients when they hit the wall. At least Talon is living on.